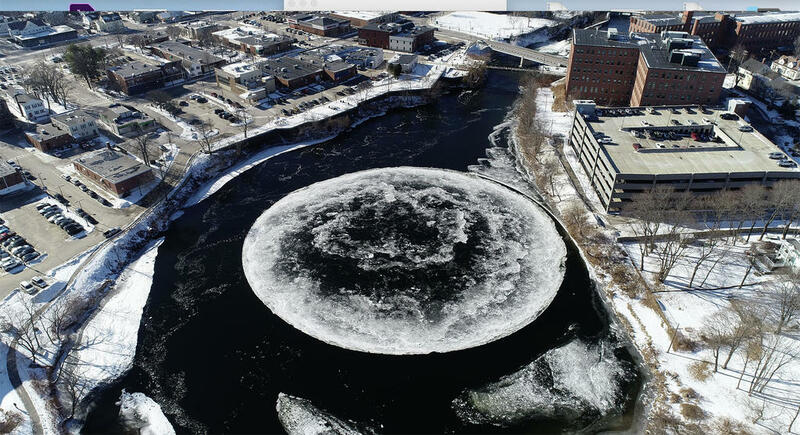 WESTBROOK — The internationally famous ice disk floating in the Presumpscot River “may be safe for the ducks” to sit atop, but it’s not safe for people, so stay off it, the Westbrook Police Department warned Thursday. Public safety received a call just after 4 p.m. on Wednesday, Jan. 16, indicating there was someone who had tethered themselves to a tree and was attempting to walk to the disk, according Greg Hamilton, director of public safety communications. Then the department got a followup call that someone had fallen into the river, but when police arrived no one was in the water. Hamilton said a woman reportedly went on to the ice to push the disk to get it to resume spinning, but she fell in waist-deep water. A man on the riverbank shore pulled her to safety. “It is hard to verify because whatever happened was done before we got there,” he said. Westbrook Police Chief Janine Roberts said Thursday the department doesn’t have the manpower to have additional staffing by the river to watch out for attempted disk walkers and is relying on people to use their best judgment and stay off the ice. The disk, which was first reported Monday, has attracted interest from all over the country and the world. The 100-yard wide disk had been spinning counter clockwise, but stopped Wednesday when it got lodged against the riverbank. By Thursday afternoon, it was spinning again after a kayaker dislodged the disk from the shore. In addition to the safety issues, there’s another reason the city wants to keep people away from the disk. “Scientists and universities are hoping to study the formation and breakup of the ice disk without human interference,” the Facebook posting said. The ice disk in the middle of the Presumpscot River is a site to see, but police are warning people to stay off of it, or any ice along the river.